"Thanks for the memories . . ."
Earlier today, I ran across a dedication ceremony for the newest memorial to be installed downtown at Tuna Harbor Park on the bay, just south of the USS Midway Museum. (Yeah, I didn’t know it was called Tuna Harbor Park, either.) Over 100 people including yours truly, along with Port Authority officials, veterans, a Marine Corps band, and even a Navy admiral, were there to pay tribute to the newest inductee into the collection of military memorials: Honorary Veteran, Bob Hope. 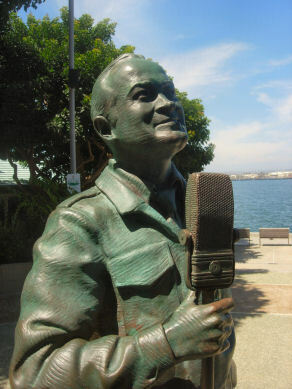 The new memorial, “A National Salute to Bob Hope and the Military,” is the crowning piece in the Port of San Diego Public Art program’s Greatest Generation Collection, which is a series of art pieces and memorials honoring people, events and military heritage from World War II to present day. Bob Hope’s presence in the collection is fitting since that is just about the same span of time that he spent entertaining U.S. troops overseas. The Greatest Generation Collection has several other powerful pieces strewn about the area, including the Aircraft Carrier Memorial, the popular giant sculpture “Unconditional Surrender,” which recreates the famous Life Magazine photograph from 1945 of a sailor kissing a nurse in Times Square, and the bronze piece that gets me the most, “Homecoming.” That’s the one that shows a sailor reuniting with his wife and child after a long deployment. You don’t have to have served to understand the emotion behind that one. With all the solemnity and emotion among the military monuments, they could sure use a visit from Bob Hope’s USO road show, which is what the new memorial depicts. 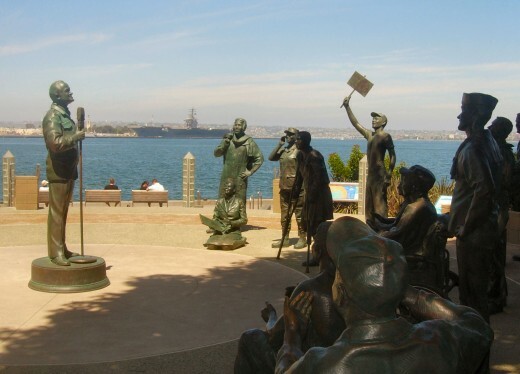 It’s actually comprised of 16 bronze statues — Bob “broadcasting from San Diego” Hope eternally entertaining 15 servicemen and women representing every branch of the military during every war since World War II. The memorial says much by itself, but you can pick up a brochure about it, and the entire collection, from the Port of San Diego. "This is Bob 'San Diego' Hope. You all know San Diego, don't you? That's the southernmost town in Los Angeles!" This entry was posted in Arts & Culture, Attractions, Outdoor Adventures, Tours & Sightseeing and tagged art, downtown, free, military, outdoors, san diego bay by Guest Blogger. Bookmark the permalink. Having had the honor of seeing Bob Hope on one of his Christmas tours I am deeply grateful for a memorial to this most amazing and wonderful entertainer. His dedication to “his troops” will be an ever lasting legacy for this nation to remember.